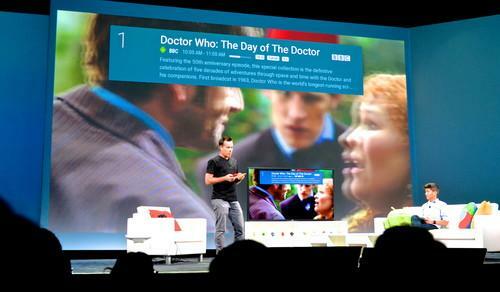 Google's Android TV, demoed on stage at Google I/O. Android TV is Google's latest effort to make inroads into the smart TV market, with a software system that can be embedded into televisions and other devices to stream content. Users will be able to stream content from their smartphones and tablets to their TVs using the system, which will also integrate with Google's Chromecast device. The company offered a look at Android TV during the Google I/O conference Wednesday in San Francisco. Android TV will work with a number of TVs, including the 2015 HD line from Sony and Sharp. The software system will be available later this year. It was unclear if there will be a hardware component from Google for the system. Android TV will integrate with apps, media, TV and other services from Google Play accounts and other apps such as YouTube. Users will be able to search for and access content from a remote or Android-based devices like their smartphone, or Google's new smartwatches. The interface is organized into cards that users can scroll through to find the content they want. The system supports voice search and games with rich graphics are also a big part of the service. The system represents Google's growing interest in connecting a larger number of devices in people's homes. Google earlier this year acquired Nest, the Internet-connected thermostat and smoke detector company. With Android TV, Google stands to gain new data about user's media consumption, as well as new opportunities for targeted ads.